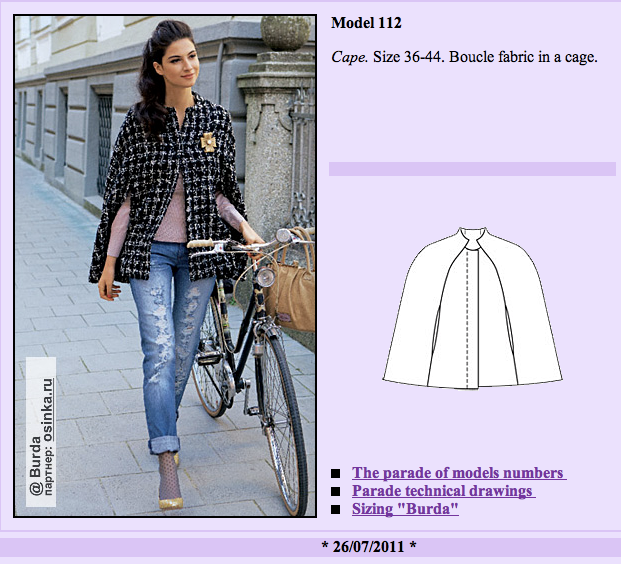 BS-08-2011-113 – Cape with pockets! The back – with vent and lots of elbow room! The opening and arm flap. 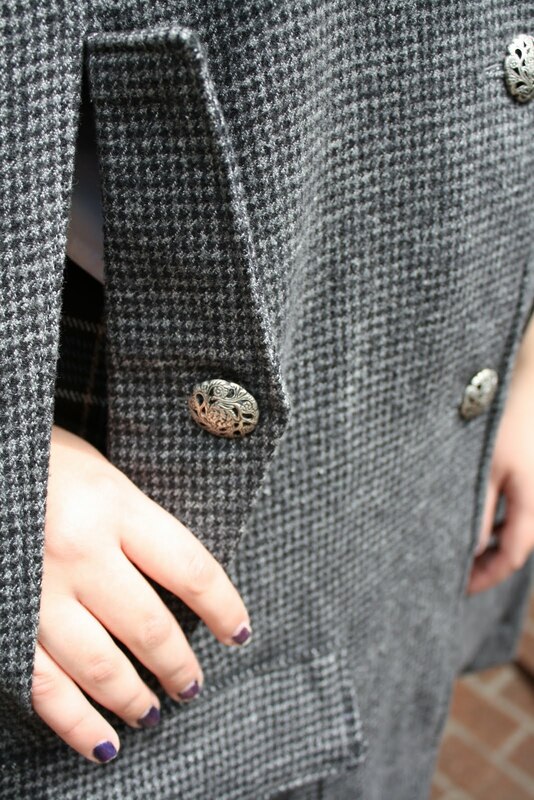 Pretty buttons, machine buttonholes, and subtle topstitching. 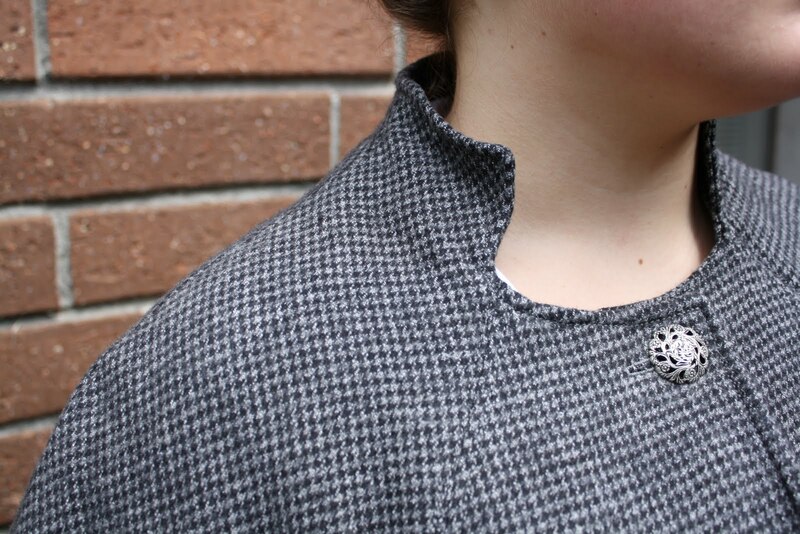 The collar line – super cute! 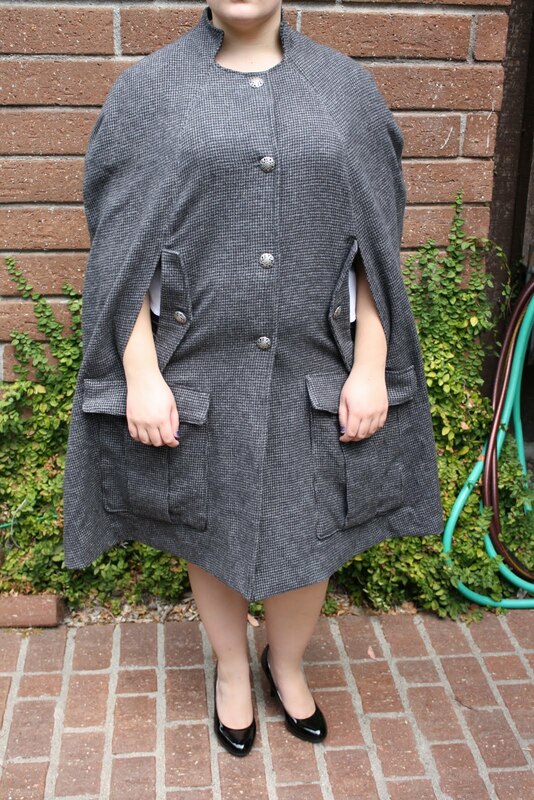 Pattern Description: Buttoned unlined cape with armholes, pockets, and back vent. Were the instructions easy to follow? I thought for the most part the instructions were pretty simple. Burda rated this as a two dot pattern (easy but with time consuming details), and time consuming it was! This project took longer than I expected because of all the details (pockets, flaps, topstitching, etc.) although it was very simple to make. Also, since this is unlined, I wanted to make sure the insides looked neat so I spent a lot of time finishing the edges. I think this would have gone faster if I had a serger. The only part of the instructions I found confusing were for the back vent. When I read through them at first it looked like the interfacing I had put on the back vent was going to show, so I sort of didn’t follow that part of the instructions. After getting to the end I realize that they wanted me to stitch down the vent by hand, as I did with the hem. Ooops. Oh well. I didn’t want to go back and pick out stitches, so I left it. Luckily the thread matches well, so it isn’t too noticeable. Other than the vent instructions I thought these were really easy to understand, especially for Burda magazine. Did it look like the photo/drawing when you were done with it? Yes! Very much! I love the subtle collar/neckline. I feel like it makes the cape stylish instead of costume-y. 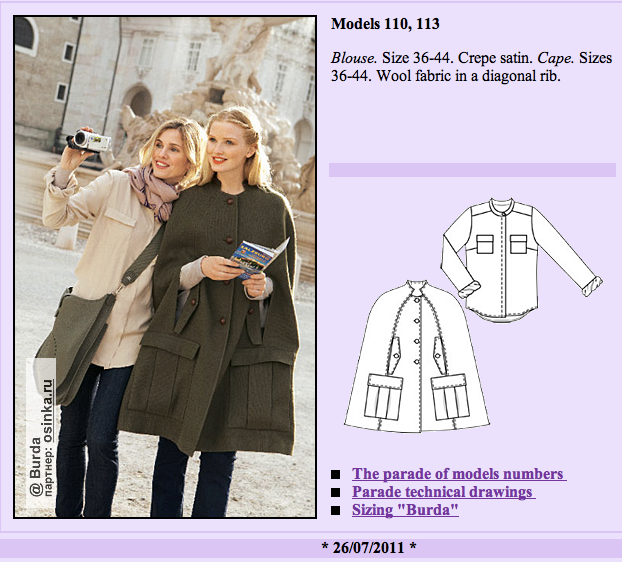 This is my third BurdaStyle magazine project and I have LOVED the drafting on every single Burda project I have made so far. 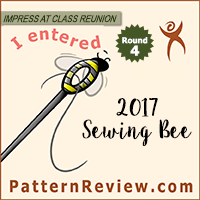 What did you particularly like or dislike about this pattern? Well, let me say that I was not a fan of the original pattern with the huge pockets. However, I made this on request because my sister wanted easy access to books/iPod/etc. while traveling. Since it can be a bit difficult with overhead/under seat storage on planes, we thought this cape might give her easy access to those items while in transit. 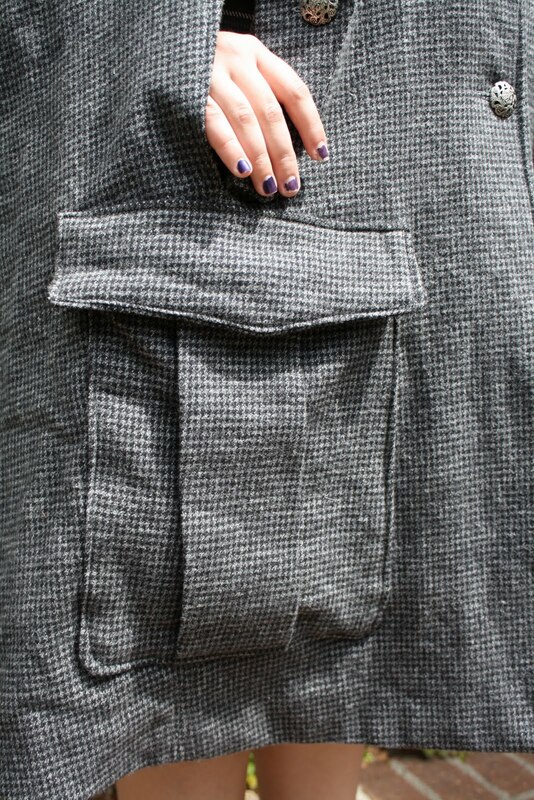 In the end, I still think the pockets are a bit crazy, but they will also be quite useful. I love collar on this pattern though. And the flap details, and the topstitching and vent details. 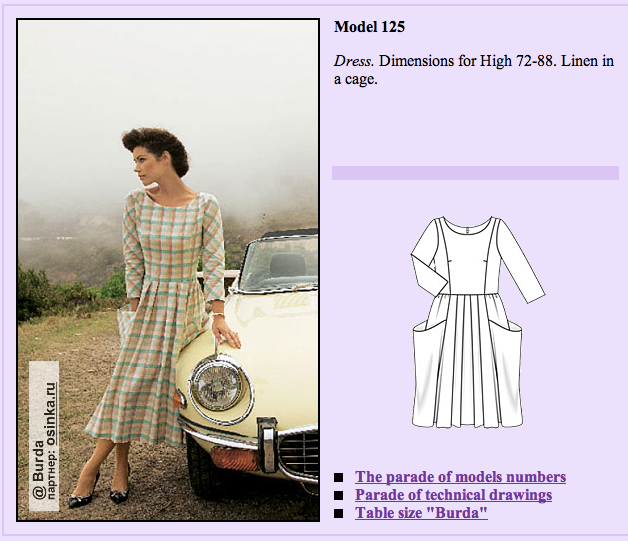 Burda drafting is top notch and I really appreciate that about their patterns. Fabric used: Cotton flanel-like fabric from Joann. It actually feels almost wooly. It presses super well and looks really nice, although it wrinkles quite easily. It was only 44″ wide, so I used 4 yards and had only scraps leftover. Since my cutting area (aka the floor) is not very large, I have problems laying out pattern pieces, and I think I *might* have been able to do a slightly better job of it, as I had to cut one piece slightly off grain, but overall I really like the look of the results. Pattern alterations or design changes you made: I did change the shape of the pocket flaps. I wanted them to have the same pointed shape as the arm opening flaps, so I made them pointed. I also machine stitched the pockets onto the cape (I thought it would be a bit stronger then my hand stitches), and I topstitched the pocket flap onto the cape. Since there is other topstitching I thought it didn’t look out of place. Also, for the arm opening flaps, I added an extra line of stitching to keep them from flipping out of the inside of the arm opening. Since the flap covers this stitching it is not visible from the outside, but prevents the raw edges from flipping out of the opening. Would you sew it again? Would you recommend it to others? Well, since this was a request from my sister I probably would not make it again. However I do think this is a great pattern. I think that I would recommend style 08-2011-112 because it incorporates all the cuteness of the collar and the look of this cape, but since it is shorter and lacks the pockets I feel it is a little more stylish. I do really like the results from this pattern though, so this pattern will get a highly recommended rating. 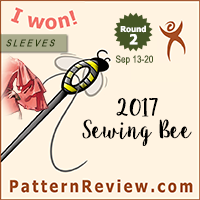 Conclusion: Pattern is great! It is time consuming (many pieces to cut out, long seams to sew up, many details and hand sewing for the hem and facings), but the results are cute. I love the collar and neckline and feel they are super stylish. I think this pattern is more wearable in the #112 version (without the pockets), but the pockets are large and will be very handy for traveling, which was the intention in making this cape. Overall I am very pleased with the results of this project and I hope it will be useful for its recipient. 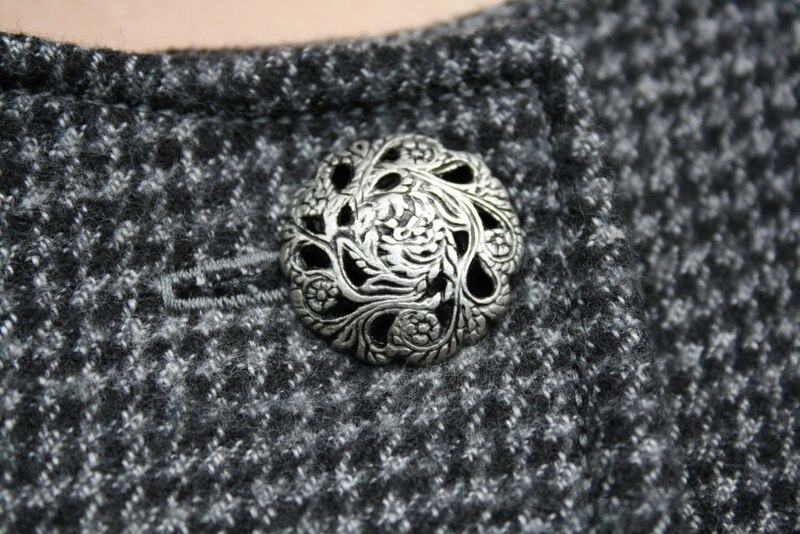 It incorporates the good parts of the other pattern, and leaves off the wacky pockets and super long length. 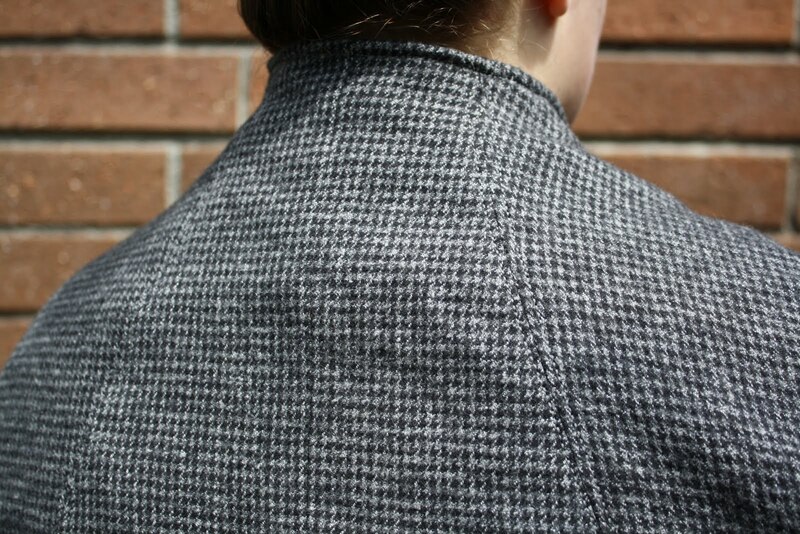 Also, I have seen a lot of cape patterns coming out lately, but this is by far the best, in my opinion. I don’t know if anyone else is going to be making a cape (Is anyone in the real world wearing capes? Is it just a pattern company thing? Does it really matter if you look cute and style it right? ), but if so then this pattern is a good choice. Joann Sales – Simplicity and Burda!